Illustrated by 150 figures engraved in wood and steel. By Andrew Ure, MD, FRS. Volume One. 1836. BOOK II. NATURAL HISTORY AND HUSBANDRY OF COTTON. 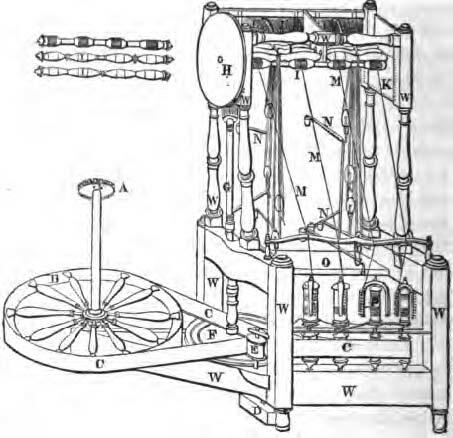 This includes a description of the silk mills of Derby and cotton mills of Belper, Arkwright, Strutt, early history of the mills and mill-owners, diagrams of machinery, patent documents and other vauluable historical information. Fourth Volume, extracts from the Book of Decrees and Orders of the Court of Exchequer by Hutton Wood (1799). This extract covers the evidence given against Jedidiah Strutt and others in Derbyshire in 1795, in considering the impact of the Enclosure Act. Valuable historical data. "Reports of the Minutes of Evidence taken before the Select Committee on the State of Children employed in the Manufactories of the Unites Kingdom" 1816. Sir Robert Peel was the Chairman. Following reports of poor conditions in the mills and the use of young children, the House of Lords conducted a full enquiry and mill owners and managers were called to give evidence. George Benson Strutt, Richard Arkwright and others are included in these papers. It includes a letter of testimony from Jedidiah Strutt of Belper. 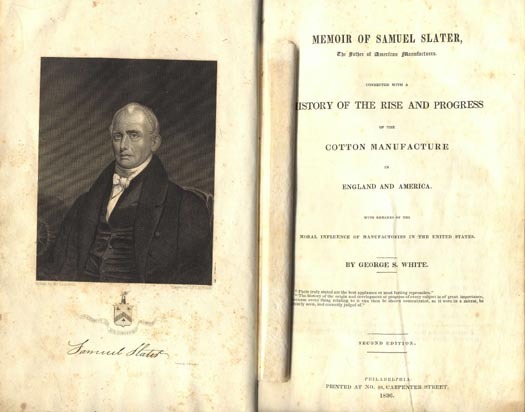 "A Memoir of Samuel Slater connection with the History and Rise and Progress of the Cotton Manufacture in England and America" by George S. White, second edition 1838. Contains information about the birth, rise and early history of Samuel Slater, his apprenticeship to Jedidiah Strutt, his travelling to America and subsequent development of cotton spinning there. Many illustrations including the mills of Belper. Most of the documents here are in PDF format. If you do not have a viewer for the Adobe Acrobat PDF format, you may download one freely here. Please note that many of these file sizes are VERY LARGE and you need a fast internet connection and patience to download them. Alternatively, you can view them in your browser with a PDF viewer plugin.